I will soon have to put away my landscape drawings. Tiny red, green, and white buds now cloud my window as bare winter topography fills in and a leafy view evolves toward a different set of drawing challenges for spring and summer. I am committed to making my art directly from my subjects; photographs and sketches just aren’t enough for me, so I follow the dictates of the season and have come to enjoy turning over drawings with the calendar. If I don’t finish these winter drawings, I will bring them back out again next November. Before I switch to the next batch of drawings in mid-April, I have my eye on finishing several pieces, but I won’t force closure. One way I do this is by rotating a mixture of drawings across the worktable, keeping many elements in flux so that I can‘t develop an attachment to a single work, nor get too involved with the inevitable stumbling blocks that arise within particular pieces. When I’m getting stuck, I move to the next work, not stopping to think much about my difficulties. Often, upon returning to that drawing, I find the blockage has evaporated, and I can see the image more clearly due to of the distance and experience I have placed between myself and the perceived entanglement. Regardless, I always ramp up the energy before disengaging at season’s end. One current drawing has been a particularly interesting challenge (image above). Created on the same paper that I use in my journals, a 90 pound hot press Arches watercolor paper, the support is thinner than the 140 pound Fabriano hot press paper that I commonly use for drawings outside my journals. On such lightweight paper, the heavily worked surface undulates, as if it were vellum or thin leather (this relief is probably best visible in the photograph at top of this entry). I like such topography, bringing attention to the drawing’s quality as an object, not just as an illusory window into another world (perhaps that’s why I’m attracted to the physicality of books.) I’ve been inclined to title this series Spreads, since the drawings have a central fold and echo the format and size of the two-page spread of my open journal. However I’ve also leaned towards continuing the Folded Self-Portrait with Night designation, as it fits the works equally well. I’ll float these working titles and perhaps I’ll wait until I finish before deciding. I’m trying a fresh experiment with media in this work as well. I’ve wanted to push some of my graphite drawings into a darker value range and I have pulled together a mix of three materials that are helping me do this. The three porcelain dishes pictured in the photograph at the top of the page contain (left) Winsor and Newton Lamp Black watercolor, (center) powdered graphite made from sharpening pencils on a sanding block, and (right) Daniel Smith Graphite Gray watercolor. I have found that by dipping a fine point sable brush in water and painting with various mixtures of the three, I can edge the silvery graphite, towards black. The drawing was first layered heavily with graphite pencil and then painted. I’ve found that I can articulate crisp detail in a different way than with pencil alone. It has been an interesting techinical development and this approach is starting to spill into other graphite drawings that I’ve been sustaining, including Night with Orion (see image below). 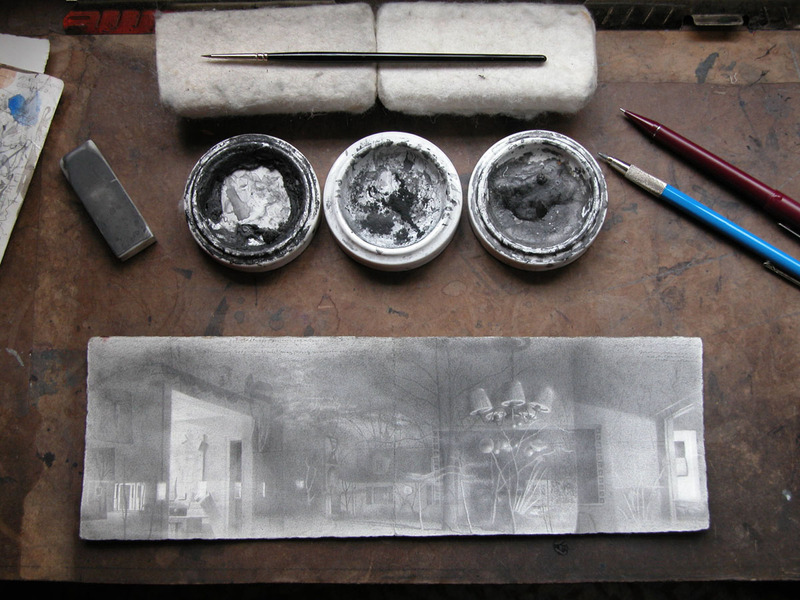 Images: (top) Photograph of worktable, 11 March 2009, featuring drawing materials and work in progress. 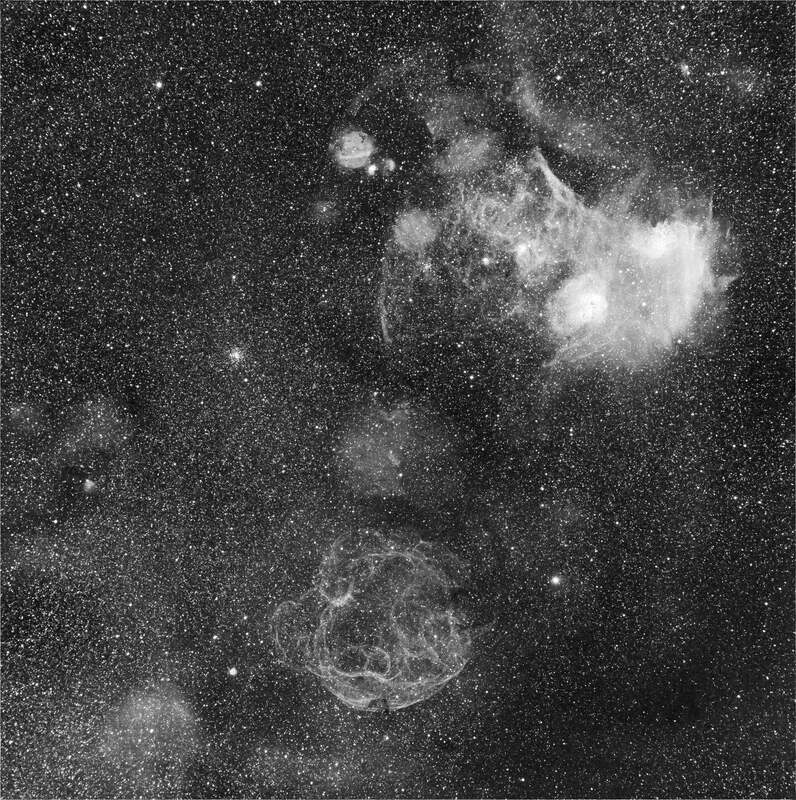 Note: For those interested in aligning the superbubble image with the night sky, another composite photograph on page 70 of April 2009 issue of Sky and Telescope shows the photograph and how it corresponds to the stars of Orion; for example Orion’s head is at the ball-shaped formation in the center of the photo and the three stars of his belt can be discerned a step directly below. 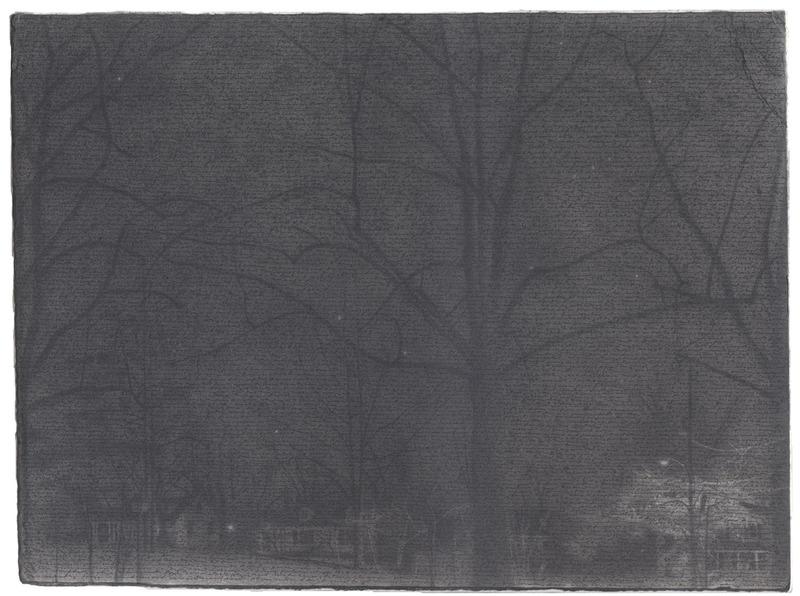 The magazine image also orients the subject as it might be seen in the context of a suburban backyard at night. [Note, January 2016: A clearer reference is pictured in a photo NASA has uploaded to its site since this journal entry was penned].